Search for your new home in Shady Oaks, an active adult community in Middletown NJ. Shady Oaks in Middletown, NJ, is an Active Adult community which is located in a heavily wooded area off of West Front Street. Although it’s located in Middletown, it has a Red Bank mailing address. Shady Oaks is a wonderful place to live, because it has easy access to shopping, fine dining and recreational facilities make. Also, shopping malls, theaters, beaches, libraries, museums, and much more are nearby. 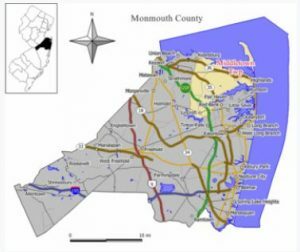 Additionally, Sandy Hook and the Jersey Shore are nearby, There are numerous public and private golf courses in Monmouth County. In addition, your pets are welcome here. The monthly association fee includes lawn maintenance, snow removal, consequently, you don’t need to do it. Additionally, you’ll have use of the common areas and clubhouse. Built in the early 1980s, there are almost 370 homes in Shady Oaks. The homes in Shady Oaks have either 1 or 2 bedrooms with 1 or 2 baths. The homes are a combination of upper and lower level condos and ranch style homes. All homes are attached, and some of these homes have a garage. Homes sizes range from 1032 sq ft to 1386 sq ft. All homes have central AC and forced hot air gas heat. Spread on a large wooded area, Shady Oaks lives up to it’s name. Shady Oaks has a large, active clubhouse. The multi purpose room gets used for the social get togethers. The clubhouse also contains a fitness center for those who desire to exercise and stay in shape. Or meet with your new friends in the library area or multi purpose room. When the weather gets warm, enjoy using the pool, tennis, and shuffleboard. Additionally, trips activities and socials are available for those who wish to join in. A shopping bus and medical transportation are provided by Monmouth County to residents of active adult communities. There is a small fee that is charged for the medical transport which is for scheduled medical visits. For those who go to New York, Shady Oaks is in a great location because of it’s location. A Park and Ride lot is nearby, in addition to the train station in Red Bank.